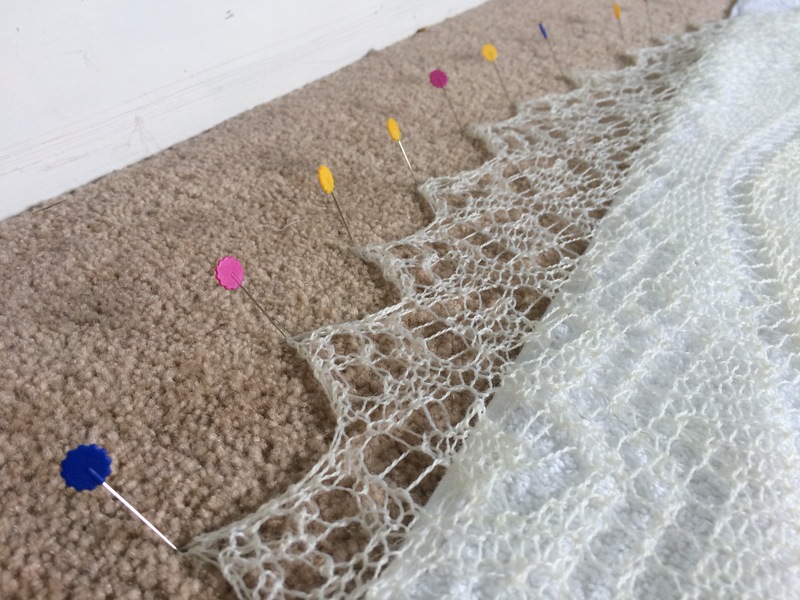 Sunday Sevens is a weekly blog series started by Natalie who blogs at Threads & Bobbins. 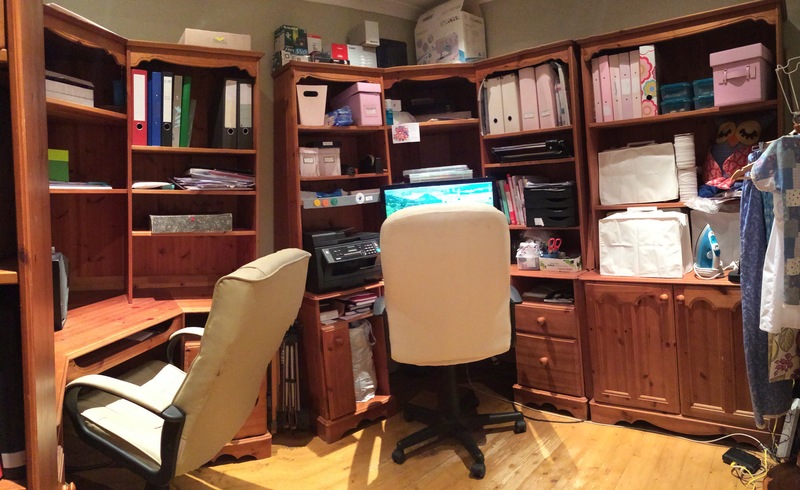 A good start to the week – a tidy and organised office!! With Mr H-L, No.1 Son and myself working from home a lot, space to work in comfort is a must. 2. 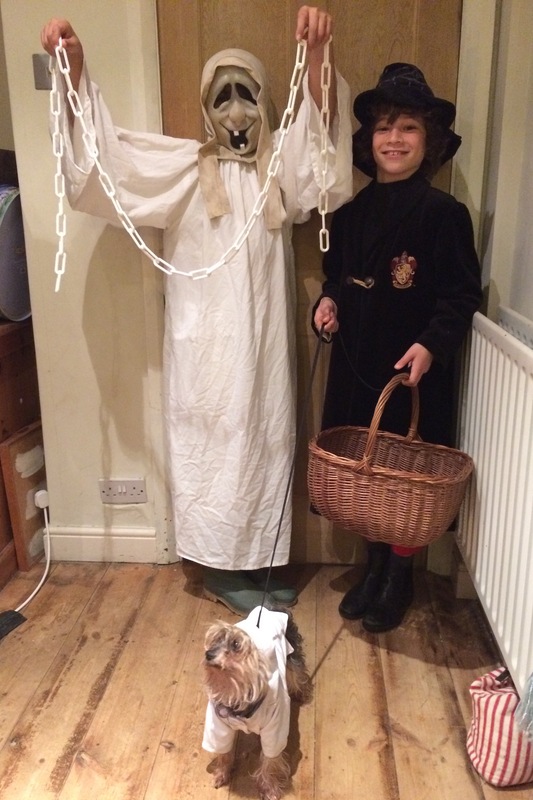 Hallowe’en – The Boys and Fifi went Trick Or Treating. Our village is so small with so few children that we haven’t had a single Trick Or Treater knock on our door in ten years! They went to a nearby town instead and came back with a basket full of goodies, largely due to the cute dog dressed up in a ghost outfit, I suspect. 3. We took an old friend out for lunch mid week. 4. The first frost of the season arrived on Thursday in our corner of Somerset. The heating has now been turned on! 5. 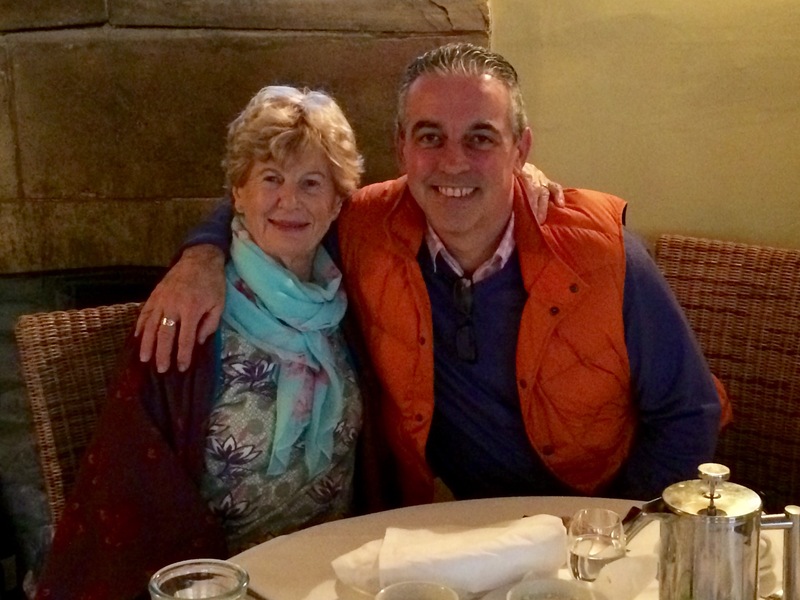 We took Mum out for a pub lunch as she was down for No.2 Son’s birthday. 6. No.2 Son is now eleven. Homemade carrot cake anyone? 7. 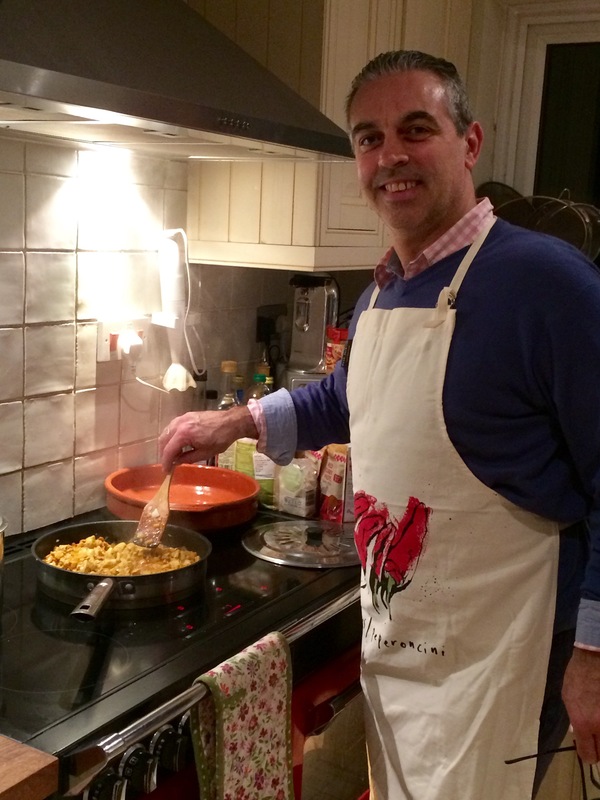 Lovely hubby cooks supper while I teach ’til 6pm on Mondays and Thursdays. 8. Guy Fawkes night was spent in our Village Hall with about thirty others. A short firework display was followed by supper and a quiz and three surprise guests needing a bed for the night! 9. After a mad week, hubby and I managed to sneak out on our own to buy him a new ‘phone and laptop for his new company. 10. The Baby Shawl has been sent at last – here’s a pic of it being blocked and a blog post will follow shortly. 11. Commissions all completed and in the post means it’s time for some long overdue selfish sewing! How about this for a dress – mustard jersey with stag’s head print. I’m now working on the somewhat complicated task of assigning swap partners for the Stitching Santa, albeit a day late. When you get your email, would you please reply so that I know it reached you? Thanks! Categories: Sunday Sevens | Tags: frost, halloween | Permalink. I love making for other people but, boy, is it nice to have time to make something for myself! Looking forward to hearing who I’ll be sewing for this Xmas! Lovely week! I think I must come to your house … homemade carrot cake, and eggs for dinner … so yummy! Happy Birthday to No. 2 boy. Looking forward to the shawl post, it looks so delicate and soft. And so excited for stitchingsanta info and ready to begin! Sorry, the cake didn’t last long! 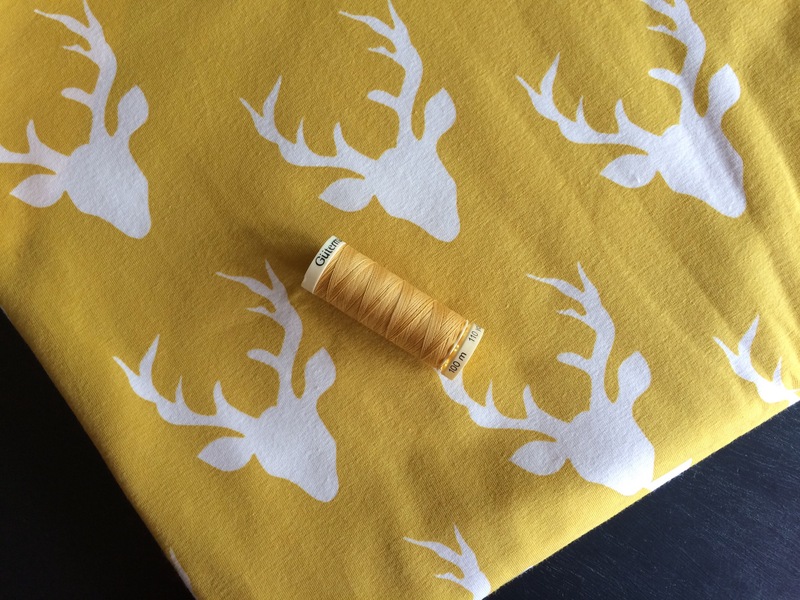 I think the stag fabric going to be a Coco dress by Tilly and the buttons – the jersey is perfect for that. Ooh! Love those stag heads. 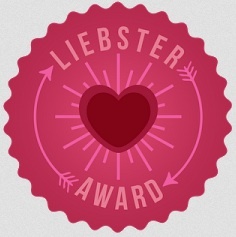 I couldn’t resist it – as soon as I saw it I just had to have it! That baby shawl is so delicate! Another lovely week. Well, jersey doesn’t fray so you don’t have to worry about finishing the raw hem edge. I use a twin stretch needle to keep the hem nice and flat, but you could just do two even rows of top stitching. Be careful not to stretch as you go though, or you’ll get a wavy edge! Love the fabric for your dress. Sounds like you’ve had a very busy week. Me too, I can’t wait to find the time to actually make the dress, but it’s been a bit mad around here lately! I find that Sunday Sevens keeps me blogging when I don’t have time to do a ‘proper’ post, and it keeps me in touch with everyone. I’ll keep an eye out for the return of yours! Looking forward to reading all about the shawl. And the stag fabric is fab! I’ll be relieved when the shawl arrives at its new home – it’s in the post as I type and I’m very anxious. If it gets lost, not only will I have to refund the amount paid, but I’ll have wasted 137 hours of precious knitting time!! Ohh, it won’t get lost. It’s always a worry though. Not much really gets lost. I wonder where those things go…? That is a lot of knitting time! Yep – most evenings since June!! What a stunning week indeed. I love your office space, it is perfect. And once again congrats to Mr H-L with the company and job. So awesome. The dog sure looked perfect on Halloween, to cute. Love that fabric, perfect design for the festive season. Looking forward to Secret Santa Buddy, will reply as soon as I get the mail. Thanks, have my swap buddy, she is great. What a lovely week! 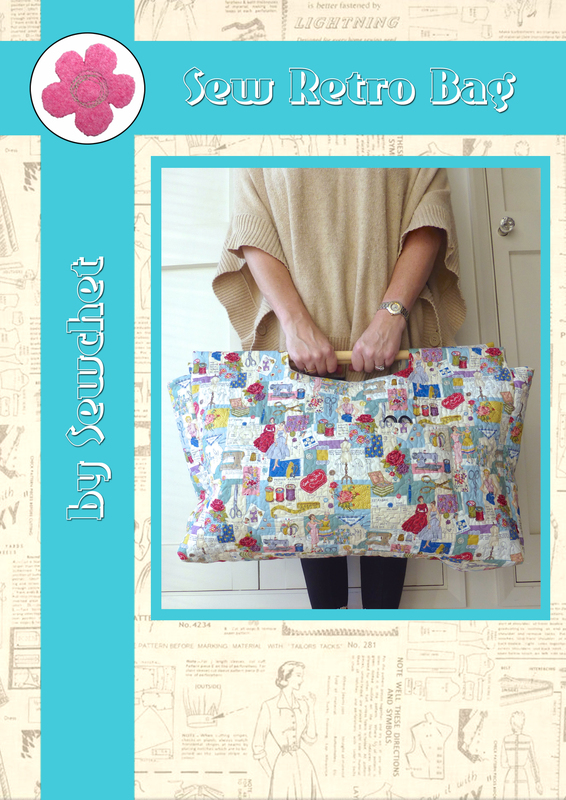 Selfish sewing looks delightful! love the fabric. Think it’ll probably be a simple Coco dress. I’ve made it as a top, but not yet as a dress. Ooh lovely, I’ve had another coco cut out for about 6 months waiting for me to sew it up haha! Give me a kick up the bum!